Prior to migration, traders must cancel all working orders, including GTC, GTD, and GTDate orders entered for SGX products. 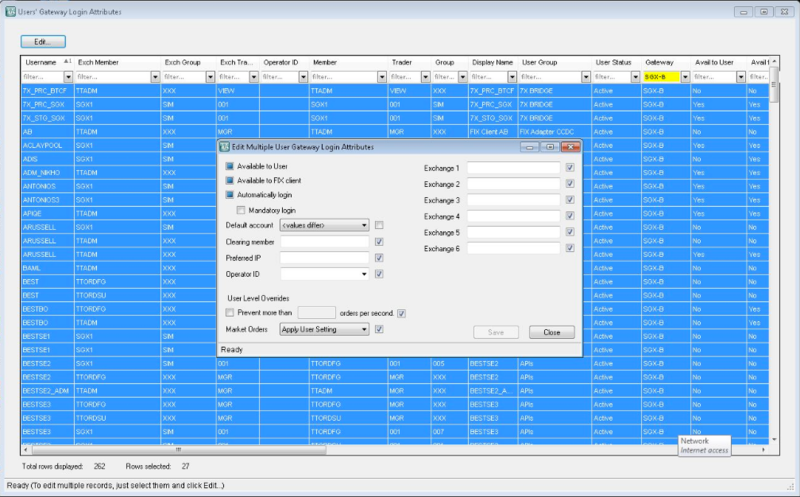 Will spreads in Autospreader that include SGX products have to be deleted in advance of the migration and rebuilt after migration? No. Note that as of September 19th, 2016, SGX has migrated OTC functionality to the SGX Titan OTC API. Customers who wish to place wholesale trades via X_TRADER must provision a TT SGX_OTC Gateway. You can begin recording data from the new SGX Gateway following the migration. If installing a new SGX Gateway, TT recommends closing all trader positions on the existing SGX Gateway before migrating to the new SGX Gateway. Users must manually enter SOD records for any outstanding SGX positions. Can traders use their existing trader IDs on the new SGX Gateway? 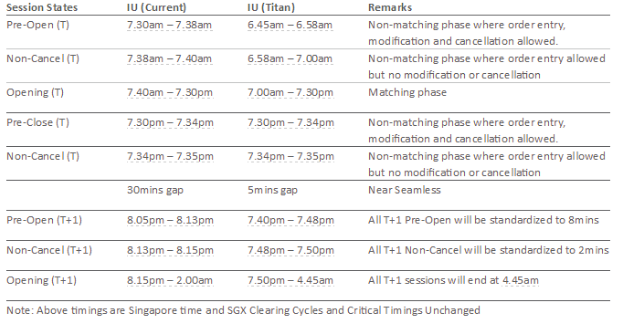 SGX is issuing new sessions to customers for use on the Titan API. Customers must create new gateways logins, or modify existing logins as necessary. Customers should create new SGX-specific order sessions. 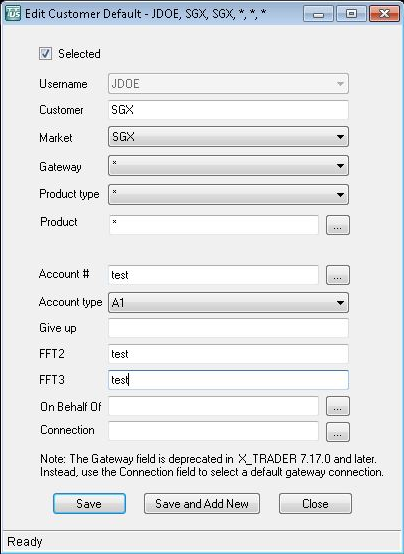 New, SGX-specific order sessions may be added to the SGX Gateway as described in the SGX Gateway Help at: https://www.tradingtechnologies.com/help/sgx-gateway/configuring-the-order-server/understanding-order-management/. Updates to Customer Defaults should be completed following the migration, (e.g., updating Account Types if necessary). Follow the steps below for each of the existing GW flavors by using migration tool in TTUS. On or after November 11th - Enable new flavors and disable old flavors. Update “Connection” in Customer Defaults if it is used. Create new flavors by copying from existing prior to the go-live on November 14th. Prior to the go-live, go to Server Admin > Migrate Users to New Gateway. After the close on November 11th, disable the old Gateway flavors and enable the new flavors from User Admin > User’s Gateway Login Attributes > Filter on a flavor > Select All Rows > Edit. Filter on the old GW flavors and disable: Uncheck “Available to User” “Available to FIX Client” “Automatically Login” and Save. The step above covers Gateway Login, Gateway Login Product Limit, Account Based Product Limit, and Customer Defaults, except for the “Connection” field in Customer Defaults. The “Connection” field has to be updated manually. To find out if “Connection” is configured, go to User Admin > X_TRADER Customer Defaults, and ensure “Conn Gateway” and other “Conn xxxx” fields are empty. Delete existing (old) flavors from TTUS after the exchange announces the final decision for go-live. The step are the same as above for Single Broker TTNET, except that migration of the existing GW flavors to the new GW flavors will be handled by TT. Refer to the above for details. After close of trading on October 28th - Enable new flavors and disable old flavors. Update “Connection” in Customer Defaults if it is used. Post Go-Live - Delete existing (old) flavors from TTUS after the exchange announces the final decision for go-live. What is the impact to SGX products? There are no dependencies that are version specific due to the upgrade to the new SGX platform. Prior to migration, traders must cancel all working orders, including GTC, GTD, and GTDate orders entered for SGX products. The exchange will not migrate any working orders to Titan. You must update all FIX Adapter Client and Server Gateway Logins with correct logins as necessary. SGX is issuing all new sessions to customers for use on the Titan API, so new gateway logins are required. Customers must delete all working orders prior to the uninstall and reinstall of the SGX 7.18 gateway. Positions for SGX products will not persist to the new SGX Gateway. TT recommends closing all trader positions on the existing SGX Gateway before migrating to the new SGX Gateway. Users must manually enter SOD records for any outstanding SGX positions. Note: Pre-migration fills will not be retrieved from the old SGX Gateway. After the migration, new *bof.tbl and *fills.tbl files will be created. Can I use Auto-SOD with the SGX Gateway? If Auto-Calculate-SOD was enabled on the existing SGX Gateway, ensure that it is enabled on new SGX Gateway after installation. As long as the Fill Server rollover times are the same for all products traded on the SGX Gateway, you can use the Auto-Calculate-SOD functionality after the migration. Due to changes in the exchange’s trading hours, the new SGX Gateway uses a different fill server rollover time than the old SGX Gateway. The fill server rollover currently occurs at 3:00am Singapore Time, but will change to 4:50am on the new SGX Gateway. WARNING: As part of the migration, SGX traders must delete all working orders and resubmit them on the newly installed SGX Gateway. This includes all synthetic and native orders submitted for SGX contracts on Synthetic Strategy Engine and Autospreader® Strategy Engine servers. At the end of the trading session prior to migration, traders must cancel all GTC, GTD, and GTDate orders that were submitted on the old SGX Gateway. Start the SGX Gateway prior to the first trading session in order to download settlement prices from the exchange. Have traders connected to the SGX Gateway resubmit their GTC, GTD, and GTDate orders for SGX products. For SGX Gateways connected to Strategy Engines, have traders resubmit their GTC, GTD, and GTDate spread orders to the Autospreader SE and synthetic orders to the Synthetic SE for SGX products. Please refer to the SGX Gateway help. Price Bridge: The OM API requires a Market Information ID, similar to previous versions of the SGX Gateway, which is used to deliver certain reference prices such as Settlement and Open/Close. The secondary SGX Gateway and Price Server must be the same version and configured with the same Exchange-Flavor and multicast channels as the primary SGX Gateway. Any changes made in the aconfig.xml and aconfig_local.mxl files (e.g., enabling PFX) need to be made on both SGX Gateways. Identical product subscriptions. For example, if the primary Gateway is subscribing to MulticastGroup=SGX-1, the secondary Gateway must be subscribed to that as well. To configure the secondary SGX Gateway so that only the Price Server runs, comment out the Order Server and Fill Server sections in the ttchron.ini file on the secondary SGX Gateway. Identical MulticastGroups.cfg files are required on both the primary and secondary SGX Gateways. Each Price Server requires that a Price Bridge is configured using a unique OM Price ID on the host in order to receive Settlements Open/Close and Price Limit prices. NOTE: The Price Server will fully start up and appear as green in Guardian even without a Price Bridge configured but will not receive Settlements, Open/Close or Price Limit prices. Configure the Price Bridge on the secondary Price Server using the same OM Price ID as the primary Price Server, but comment out the Price Bridge section in TTChron on the secondary server. In this case, should failover to the secondary Price Server occur, Settlements, Open/Close and Price Limit prices will be missing on the secondary. When this occurs, the customer may perform a manual failover of the Price Bridge by enabling it in in TTChron after disabling it on the primary. Since ITCH is not currently supported outside of the SGX colo facility, TT has added the ability for the gateway to run an OM Price Server in the event of a Disaster Recovery scenario. # TO DO: Configure as appropriate for this market and the server time zone. ## TO DO: Configure as appropriate for this market and the server time zone. Note that no configuration changes are required in the hostinfo.cfg file, since the OM Price Server will use the same credentials and configuration as the OMPriceBridge. 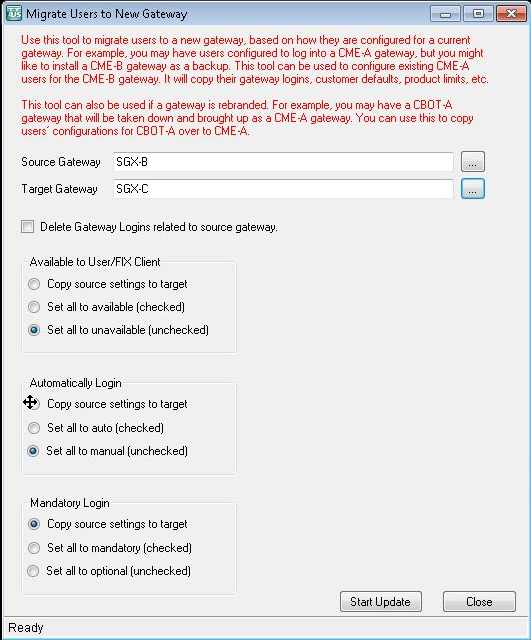 How do I migrate an existing SGX Gateway to a new SGX Gateway on the same machine? Upgrades from the TT SGX 7.17.x Gateways to 7.18 are not supported. Does this affect ‘persisted’ algo templates? What is the impact to Strategy Engines (SEs) connected to the new SGX Gateway? Autospreader® SE, Algo SE, and Synthetic SE servers connected to SGX Gateways in your trading environment are impacted. What about working orders on SEs for SGX contracts? Prior to migrating to the new SGX Gateway, traders must delete all working native and synthetic orders submitted for SGX contracts on a Synthetic Strategy Engine, Algo SE, or Autospreader® Strategy Engine server.